We will be introducing our Founding Members individually in each of the monthly APUEA Newsletters. It is our pleasure to introduce our first Founding Member – Johnson Controls. Johnson Controls is a global diversified technology and multi-industrial leader serving a wide range of customers in more than 150 countries. It has more than 120,000 employees creating intelligent buildings, efficient energy solutions, integrated infrastructure and next generation transportation systems that work seamlessly together to deliver on the promise of smart cities and communities. Johnson Controls’ commitment to sustainability dates back to its roots in 1885, with the invention of the first electric room thermostat. The company is committed to helping its customers win and to creating greater value for all of its stakeholders through a strategic focus on buildings and energy growth platforms. Johnson Controls Building Technologies & Solutions is making the world safer, smarter and more sustainable – one building at a time. The company’s technology portfolio integrates every aspect of a building – whether security systems, energy management, fire protection or heating, ventilating, air conditioning and refrigeration (HVACR) – to ensure that it exceeds customer expectations at all times. In each country of operation, Johnson Controls has an unmatched network of branches and distribution channels, helping building owners, operators, engineers and contractors enhance the full lifecycle of any facility. Johnson Controls’ arsenal of brands includes some of the most trusted names in the industry, such as Tyco®, YORK®, Metasys®, Ruskin®, Titus®, Frick®, PENN®, Sabroe®, Simplex® and Grinnell®. For more information, please contact Renee.M.Clair@jci.com. APUEA welcomes Mr. Rob Thornton, President and CEO, International District Energy Association (IDEA) and Kateri Callahan, President, Alliance to Save Energy to its Advisory Board. In addition, both IDEA and the Alliance to Save Energy have agreed to reciprocal memberships with APUEA. The new members will be valuable assets to the board as it guides APUEA in all operational aspects. The Advisory Board now comprises representatives of the Danish Board of District Heating (DBDH), Euro Heat & Power (EHP), United Nations Environment (UNE), Asian Development Bank (ADB), International District Energy Association (IDEA) and the Alliance to Save Energy. A two-day District Heating & Cooling conference – organized by Marafeq Qatar, Qatar General Electricity and Water Corporation (KAHRAMAA), and Euroheat & Power (EHP) – was held in Doha on 23-24 October 2017. Mikael Jakobsson, Executive Director of APUEA, made a presentation to the delegates on the establishment of APUEA to serve stakeholders interested in developing urban energy systems in the Asia Pacific region. The APUEA Secretariat has been responding to several membership inquiries since the conference. Mikael’s presentation can be downloaded here or available in the Publication section of the APUEA website. 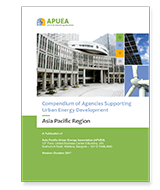 The APUEA Secretariat has completed its first publication, “Compendium of Agencies Supporting Urban Energy Development in the Asia Pacific Region”. This 190-page document provides contact details for Government and non-Government agencies that are directly or indirectly related to urban energy systems in 50 Asia Pacific countries. In addition, it provides information on agencies in North America, South America, Europe and Africa that could be useful links to potential developers. Members can download the document from the APUEA website www.apuea.org. Future publications will be undertaken based on the priorities of the membership. As a standard procedure, the Secretariat will survey all new members to understand their priorities and determine how the Association can best serve their needs. The APUEA is an initiative of the International Institute for Energy Conservation (IIEC), a not-for-profit organization that has been promoting sustainable energy and environmental solutions in developing and emerging economies – including in the fast developing urban sector – for more than three decades. The APUEA platform promotes public and private sector collaboration to develop sustainable urban energy systems that support livable cities across the Asia Pacific region. The Association's online portal serves as an information hub to support city policymakers, program managers, and other stakeholders in the design, development, and implementation of sustainable urban energy systems. Through this portal, APUEA events, and continuous outreach to its members, the Association shares international and regional best practices for planning and implementing sustainable urban energy systems – including policies and regulations, business models, and technologies for implementing district heating and cooling, smart grids, energy efficiency improvements, and renewable energy systems. For more information about APUEA, contact info@apuea.org or visit www.apuea.org. Copyright © 2017 Asia Pacific Urban Energy Association, All Rights Reserved.